Search Marketing Standard Magazine | Covering Search Engines > SEO > Link Building > Do Nofollow Tags Really Pass Link Love? I have been hearing a lot about this in the blogosphere. Everyone seems to be doing their own tests or shouting out their opinion on this topic and really that is all that is out there. Some people say nofollow tags pass on link love and buy levothroid some don’t. This is all part of what SEOs go through on a daily basis. Some people feel certain tactics work better than others and it’s all based on experience. So what’s the real deal with nofollow tags? First, what’s the reason for a nofollow tag? Perhaps there was a growing concern about comment spam in the search engine. Possibly to help eliminate Google bowling. Maybe to help these engines rank outbound link love more appropriately. From the looks on this graph, comment spam is really a problem within the blogosphere. But it seems that the nofollow tag is an attempt at fixing a problem within the search engines at our expense, take a look at #7. Here is what I do know. Any link with a nofollow tag is still being followed, at least by Yahoo. Lets take a quick look at a backlink result to double check this. Check out an old friend of mine’s backlinks in Yahoo. He left a comment at SEOblackhat and Yahoo picked it up as a link. We can obviously conclude that some search engines do follow nofollow links and bring them back into their link index. Now what about nofollow tags carrying weight? Thats a really great question and I know there has been some debate order atarax on this topic so let me lay out what we know so far. Neil from Pronet Advertising did a post back in march about a guy who comment spammed a bunch of sites to with an anchor text of “piderman 3″. Below is an image of that result. I must say that it seems obvious that there is relevancy passed through a nofollow, at least with Google. On the other hand I see a site that is #5 for nolvadex purchase a term that only brings back 224 results in Google. I do not think its safe to say that nofollow links can help you rank well for competitive terms or even semi competitive terms. Lets also consider the text on the page. On his home page it does mention the term that is being searched. That could have something to do with it. Shard, who did the "pidaman" assessment of nofollow links made one tiny error. While he was focusing on the page that he submitted comments to, he completely overlooked the box on most WP blogs that list Recent Commenters -- those links do not have the NoFollow attribute and his link was exposed sitewide. There is also the plugin for WP for Top Commenters, which probably did not apply to Shard -- for he was just hitting the blogs and running. But if he managed to get on that list, again the links do not have NoFollow and another risk of sitewide exposure. Therefore, his theory of passing weight for his keyterms is debunked. I tried leaving a comment on his post, but evidently I was either Akismet-ed or my comment was not approved. Either way, I gave up trying to comment there. That's actually a good point. So are you saying that nofollow links carry no value? Thanks for clarifying. I agree completely. Besides, there are still some nofollow links that are good to have, like Wikipedia, for example. It might not affect ranking but it could bring in some extra traffic. Wikipedia is a different slant on the whole NoFollow controversy. Originally the microformat was suggested by Google to combat spam, then it evolved into the "we don't vouch for this link" attribute. Google looks at Wikipedia as an authoritative site, does it not? When they are no longer "vouching" for those outbound links, then does that mean Google is NOT going to apply weight to them anymore? If not, then Wikipedia is a useless resource to Google and others as well. I don't believe for one second that Google is not going to use any weighting factor for those links -- maybe not PR, but some kind of authoritative twist in their algorithm. Thanx Andy, I stand corrected. And I like Ask's response of "We have never officially supported No Follow, so your questions don’t apply to our crawler/ranking." Actually, I think that was the answer to all of the questions! ;) The only SE missing from that group was Microsoft's Live Search. Wonder what their slant on this is. I would suppose that "nofollow" would equate to "no juice", but do they follow the links? Isn't the point of nofollow to protect the originating site from comment spam so that they are not penalized for allowing comments from untrustworthy sites or spammers (same thing)? Whether nofollow passes link juice is of concern only to those who comment spam or hope for value from links at Wikipedia or major blogs using nofollow. Why should anyone care if those links pass link love unless they routinely link spam? The argument over nofollow-link-love would only matter to link spammers - no? Sites use it as safe linking "protection" and what the search engines do with that may vary - but still - why should someone NOT doing link spamming care about the link juice? Could it be that there is jealousy of link spammers? "Hey! That's no fair! They got link love from those nofollowed links!" Nah - that can't be it. Maybe the site using nofollow is upset that they still confer link love even though they are using link condoms? No - probably not. I wonder who that leaves? That's a very interesting list about no follow, have to agree with much of what you mentioned. &gt;&gt;I don’t believe for one second that Google is not going to use any weighting factor for those links — maybe not PR, but some kind of authoritative twist in their algorithm. I would think this would be the case, if nothing else than for high authority sites using no follow. search engines do follow NOFOLLOW tags and index them them too but dont count them when they are ranking a website. Check out Everything you need to know about rel=nofollow over at Virtual Marketing Blog for an exhaustive look at rel=nofollow. They show how each search engine treats the nofollow tag. Above they were talking about no follow only applying to spammers. This is definitely not the case. No follow may apply if you are blogging about a competitor or perhaps linking to an unruly site (which you do not want to indirectly advertise for). Google follows nofollow links - so you can use them to get Google to index a site - it just won't factor in any authority or link juice out of it. i didn't understand about google.because some times no-follow's is wonderfull backlink.some times not anything. some blog's use follow for comments,and much blog is use no-follow. :S for example your blog is follow.and in google you stay top. Personally, I think there still is some value in the NoFollow links, and it truly depends on the quality of the site that they come from. 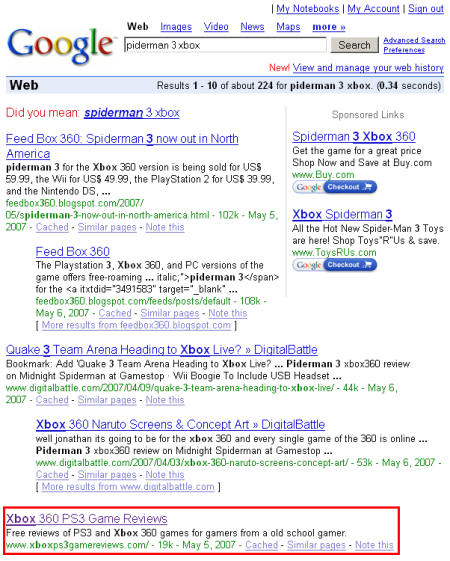 I think that the relevancy issue plays a role in the overall value assessed by some of the search engines. Nofollow does not stop bots from following the links. The only thing nofollow does is stop your rankings from going to unwanted sites! Does anyone know of an easy method of detecting whether or not a blog uses the nofollow tag, other than opening up the source code? Bots may follow it, but does anyone know if it definitively stops Google Pagerank "juice" from being given to the linked site? If you "trust" Google toolbar pagerank, you can be quite sure that nofollow links do not pass any link juice, because all the pages inside websites that have only nofollow link linking to them do not display any pagerank information. I doubt Google has some special hidden pagerank for these nofollow pages ... As a side note, it was a big surprise to me when I tried an experiment of hiding URL's by using onclick goandshowfunction('http://link.com') ... Google was able to index those pages. So it seems that Google picks up all the readable URL's from JS and indexes them also nowdays. I have noticed that sites that rely on low-quality inbound links did not seem to get penalized when their links were no-followed. Perhaps they were grandfathered in? You have to wonder that there may be some slight importance placed on having nofollow links. I know many SEOs that use nofollow links to get sites indexed quickly since the links are followed. However, I have never met anyone that made an entire campaign solely on nofollow links. I also believe Google can be "clever" with what it says and means when you do not read between the lines. I think nofollow links count. I heard that someone fot a pr3 from 2 pr5 nofollow links and just them. I am confused. .-= Debojyoti´s last blog ..10 reasons to LOVE Adsense =-. BTW happy Halloween .-= Debojyoti´s last blog ..Happy Halloween to All =-. I think that nofollow link don't provide as much benefit as follow links. .-= Victor´s last blog ..Day Trip to Boreal 2010 =-. Yes you are absolutely correct that Google does not give preference to no follow links but Yahoo does. ya I also think that nofollow tags are beging considered , If the link is from related page of our niche. I have experience this many time. I was not able to find dofollow blogs before and So that I started commenting on nofollow blogs also, and that gave me wonderful results. As we are building a relatively new site, we are faced with this dilemma... How do we get ranked locally? Our site is not revenue producing, it is simply hoping to attract clients to our practice... this poses a problem. Backlinks are so important, but it seems that very few good blogs, that are on topic, of course, allow dofollow comments. This blog, is an exception, however, it's not exactly "on topic" for our office. I am wondering if there are any other suggestions for higher ranking locally.